News: a group of libertarian activists in the U.S. plans to distribute open-source blueprints for homemade 3D-printed guns, provoking questions about the potential uses of the increasingly affordable technology. Defense Distributed, the activist group led by Texas law student Cody Wilson, has just received $20,000 in funding for its Wiki Weapon project to create instruction kits for working guns. Individuals would be able to download the kits and use them to 3D-print their own weapons at home, sidestepping the need for a gun license. News of the project comes just weeks after another American hobbyist became the first person to successfully build and fire a 3D-printed gun. Michael Guslick claimed to have fired 200 rounds from his .22 calibre pistol, which he made by fitting a 3D-printed plastic receiver – the only part of a gun that requires a license in the U.S. – to the other gun components, which don't have to be registered. Guslick said he then adapted the components to make a semiautomatic rifle (below). Anab Jain, founder of the collaborative design practice Superflux, drew attention to Guslick's homemade gun and the legal and ethical questions it posed at last week's Global Design Forum in London. Making guns with 3D-printing technology might seem "unsettling", she told the audience, but it points to the dramatic changes that lie ahead as design expertise, technology and equipment become more accessible to individuals. "The old rules and regulations about who is the designer, who is the manufacturer and who is the distributor change when people have the tools and opportunities to become the designer, manufacturer and distributor themselves," Jain told Dezeen today. "The problem is that sometimes we get so scared about new technology and just think about the worst case scenario, which is what happened with GM [genetically modified food]," she added. "It's about making sure there is a possibility to debate these things instead of just becoming passive consumers and saying, ‘tomorrow I can order a 3D-printed gun if I want’." 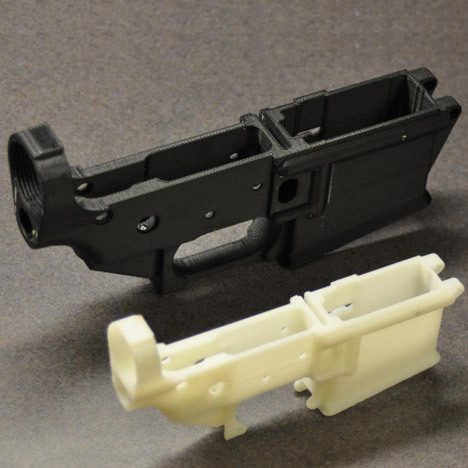 3D printing technology has become significantly more accessible recently, with retailers now offering the printers for as little as $600, but the legality of homemade guns remains an unresolved issue. On its website, Defense Distributed states: "It is legal to produce any category of weapon you could ordinarily legally own, so long as you are not providing it for sale or are not prohibited from possessing firearms in the first place." These rules would only be relevant to U.S. citizens, however. "If you are in another country, proceed with the expectation that every bit of this is illegal," the website adds. Today the group made public a letter it had received from StrataSys, a company that makes 3D printers, cancelling their lease of a printer and stating that it was company policy "not to knowingly allow [its] printers to be used for illegal purposes." Meanwhile, the group has announced that computer files for its 'WikiWep' prototype plastic handguns will be made available for download in the coming weeks. Digital manufacturing and open-source design have dominated the debate at this year's design fairs. Following Milan's furniture fair in April, Dezeen's editor-in-chief Marcus Fairs explored the new era of digitally driven production in a post for our series on technology and design. You can see all our stories on open-source design here. We also recently reported on a robotic 3D printer that makes architectural structures from sand or soil – see all our stories about 3D printing here.